AT THIS POINT IN YOUR PROJECT, OUR PRIMARY CONCERN IS TO SAVE YOU MONEY ON PURCHASES AND HAVE ALL OF THE NECESSARY PREREQUISITES IN PLACE TO IMPROVE YOUR HOME. Help you identify professional builders you want to invite to tender for your project. You may already have a builder in mind and require comparison prices from other builders including members of our professional network. Create the tender pack to send to prospective builders. This ensures all quotes are calculated on a like for like basis making your decision a lot clearer. Create a personalised specification document for the proposed works keeping inconvenience and disruptions to a minimum. Help you identify the costly items you should be purchasing yourself by accessing our trade contacts and discounts, saving you £1000s on your project. Remember, it has taken us 40 years to create our trade discount network of suppliers. Help you work through all the builders quotes and identify where the these are above expectation. We are happy to re-negotiate on your behalf. We are here to work for you and not for the builder. Discuss and identify the builder that is most suited to you. It is not always lowest price that determines who you award the contract to. is The decision often includes personalities and who you feel you can get along with for the duration of the build. 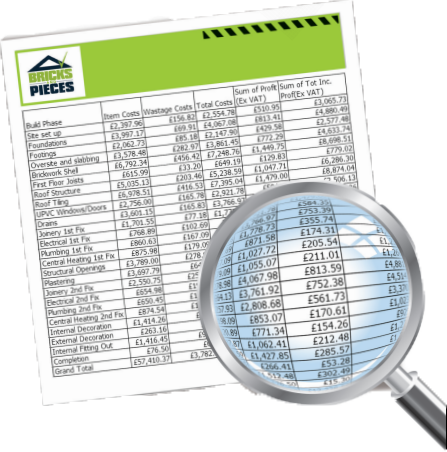 We start off step two by calculating a detailed independent costing for your home improvement project. Our bespoke software is updated weekly with material costs, industry average labour costs, plant hire and builders’ anticipated profits and overheads. Unlike the indicative costs, we worked out during the Plans and Designs service in Step One we now calculate a detailed independent price for your works. Our bespoke software is updated weekly with material costs, industry average labour costs, plant hire and builders anticipated profits and overheads. We will calculate what the associated building costs are, for each of the building phases so that we have all of the relevant accurate costings, to further negotiate the price, with the builders during the tender process. A great way to make sure you will always be in control of your project, we produce a personalised specification document for you. 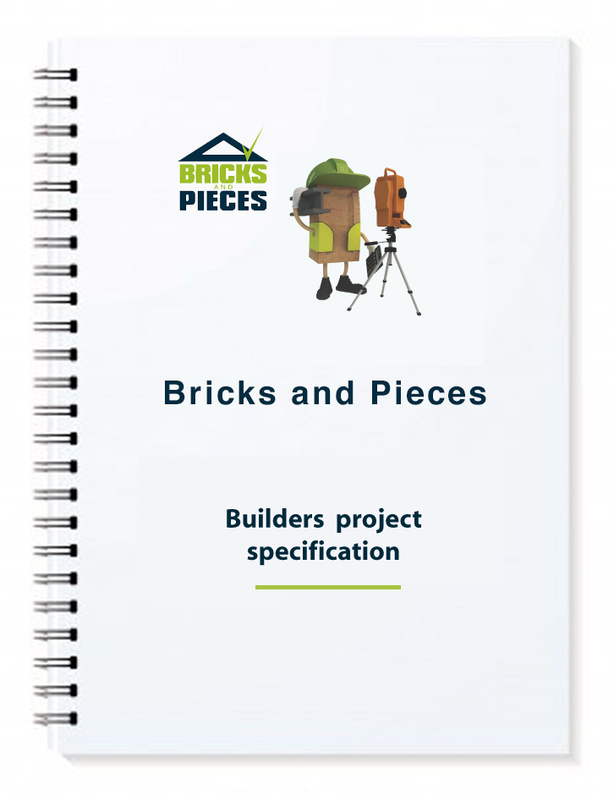 Your specification document will detail how you want the building works to be carried out. This will provide your builder with a clear direction and minimise miscommunication. To ensure you will always be in control of your project, we produce a personalised specification for you. There are a number of different ways to undertake building works but if you do not provide a specification for how you want the works to be executed within your tender documents, the builder has no clear direction and will do it his way. You will then likely find yourself losing control of how the works should be undertaken to minimise inconvenience to you and your family. Without a detailed specification, you may find yourself living in a building site with limited utilities or worse, incurring the expense and inconvenience of having to rent alternative accommodation. With many years in the domestic design and building industry, we know the most effective way to ensure inconvenience is kept to a minimum. The specification document will eventually form part of the documentation included in your contract with your builder so must provide clear instructions that can relied upon should the need arise. In order for you to save money on your project, we will help you compile a shopping list and help identify how you can save money via our trade discount. We do not have a magic wand, but that does not stop us from creating miracles. 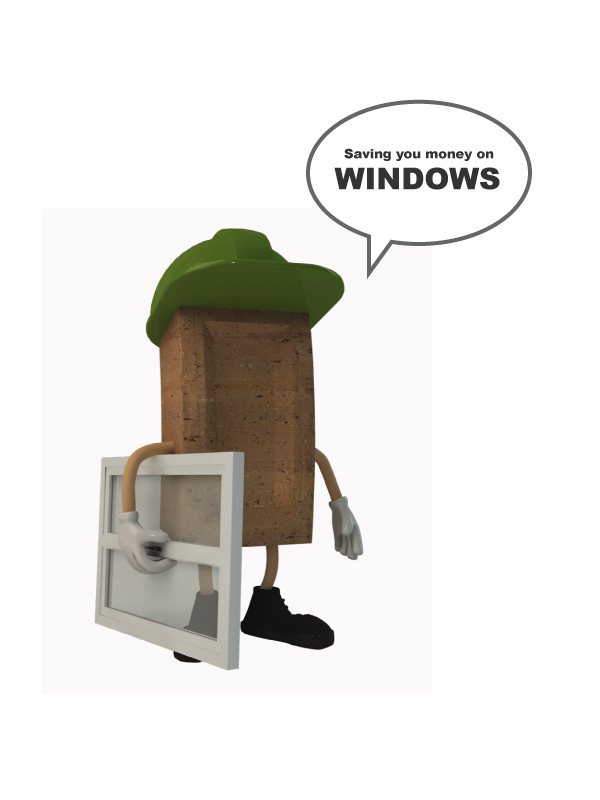 With our trade discount and contacts in the industry we can help you save up to 50% on your purchases. Once the specification is complete, we will help you to identify the items you could be purchasing yourself using your Bricks and Pieces Trade Discount card and the industry contacts we have built up over the years. Our contacts and suppliers are all vetted to provide an extensive range of quality items like fitted kitchens, bathrooms, Bi-folding doors, windows, tiling, floor coverings and are all contracted to provide trade discounts to customers of Bricks & Pieces. We are proud to boast that 87% of our clients who use our services in 2017 not only saved the cost of the our design fees but went on to make further significant savings, using our trade discounts and contacts. When all the items our clients procure with our help, using the trade discounts have been identified, we exclude these items from the builder’s tender documents. 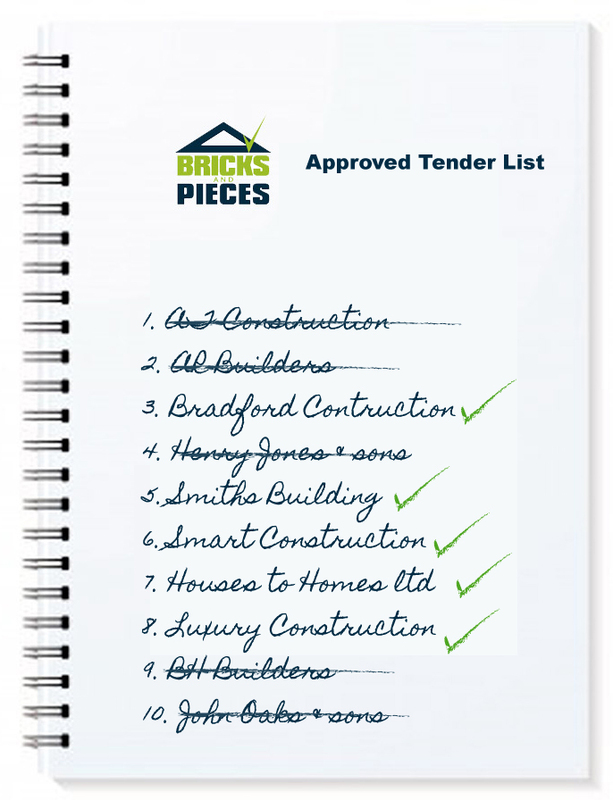 We produce the bespoke tender documents and send them to each of the builders selected to tender the works. This will ensure that everything in your project is detailed in black and white. Outlining all of your project requirements. You may already know a builder that has worked for you before or been recommended to you. It’s important to check whether they have successfully carried out previous work on time, on budget as well as meeting the highest standards of workmanship. Good builders are worth their weight in gold and should always be invited onto your tender list. We are happy to recommend builders from our own network of approved builders as alternatives/additions to tender. To be added on to our approved list, a builder must pass through our strict due diligence tests. Most have worked with us for many years, always completing contracts on time, on budget and to the standards we insist upon. In order for you to get the best deal on your renovation, we are happy to recommend builders from our own trusted network of approved builders. You may already know a builder that has worked for you before or been recommended to you. Either way, we aim to get you the best quotes. We produce the bespoke tender documents and send them to each of the builders selected to tender the works. We give the builders 14-21 days to submit their competitive prices. During this time, they will contact you directly to introduce their services to you and arrange to visit your home. We give the builders 14-21 days to submit their competitive prices and communicate with the builders on your behalf. We will provide completely independent advice and will help you identify any items that are overpriced and help negotiate on your behalf. Once all the quotations have been received, we will identify areas of the building phase or phases that we feel are overpriced and then go back to those builders to negotiate their prices. We offer professional advice to you and always act for you, independent of all of the builders. We will help you to decide on the builder you wish to instruct. The choice is rarely based solely on cost; many of our clients tell us they have a better feeling about one builder over another. It is important to remember the builders will be working with you for several months so it is crucial you can get on with them.